Japanese Episode AG 126: "The Arrival at Saiyuu City! A Nyasu in Boots!?" 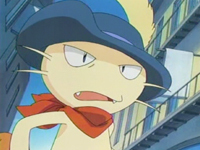 American Episode 396: "Like a Meowth to a Flame"
As our heroes arrive in Saiyuu City, Satoshi anxiously awaits the Houen League that will be starting in one week. However, instead of training right away, Haruka convinces our heroes to go searching for a ramen shop instead. The place Haruka's guide book takes them seems to be deserted except for a flock of Yamikarasu. The bird pokemon don't seem to be happy to have visitors, so they start to peck at Satoshi and his friends! The gang is saved by a trainer named Tetsuya and his boots-wearing Nyasu, who quickly sends the crow pokemon retreating. Before long, Tetsuya reveals that he's competing in the Houen League and will be carrying the flame of Fire during the opening ceremonies! 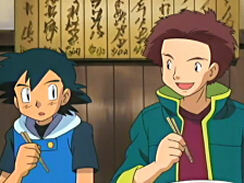 While Tetsuya receives instructions from Tamaranze-Kachou, Satoshi registers for the Houen League. He also calls up Orchid-Hakase, who offers to send Satoshi any pokemon he may want to use. Satoshi says there will be no need for that, declaring that he will go through the Saiyuu Convention using only the pokemon he's trained with in the Houen region. Later, our heroes reunite with Tetsuya, who tell our heroes that the sacred flame has been stolen! The thieves turn out to be Musashi and Kojirou, who fight off Satoshi-tachi while the Rocket-Dan's Nyasu faces off against Tetsuya's Nyasu. The battle between the two cat pokemon ends with Tetsuya's pokemon winning, but the Rocket-Dan's Nyasu vows to get its revenge someday. The Rocket-Dan are soon sent blasting off, and so the fire ceremony is able to continue as scheduled. Now that the flame has been lit, Satoshi anxiously awaits competing against this new rival in the Houen League! We always have to get the obligatory "the sacred flame is stolen!" episode, and this one is actually quite good. The anime producers manage to cram a whole lot into the episode, from the sacred flame storyline to the rivalry between the two Nyasu to Satoshi's decision not to use any of his old pokemon. We also get to see Tamaranze-Kachou again, another Boss Fantasy, crossdressing, and a Metagross who actually does something other than wave pom-poms while Lovely Boy plays in the background. One thing I'd like to point out is the fact that Tetsuya's Nyasu is a parody of the 17th century folktale of the same name, not the character in Shrek 2. Some people think that movie invented the character or something (just like fans think Eminem invented the "won't the real _blank_ please stand up? "), but a quick search somewhere like Wikipedia reveals otherwise. Speaking of Tetsuya's Meowth, the pokemon is given this gay lisp in the dub. At first I wondered why that was, but after Team Rocket's Meowth called him a "cowboy," I figured that they must have been going for a Brokeback Mountain reference. Funny thing is, Tetsuya's Nyasu isn't dressed like a cowboy at all, so the allusion kind of doesn't hold together at all. The dub does a few other things worth pointing out. Tetsuya is now called Tyson, keeping with the pattern of giving Ash's rivals names that end in -son (Harrison, Morrison, and now Tyson). The name Tyson was already taken by the Team Rocket member who was after the Red Gyarados back in Johto, but I guess 4Kids forgot or don't care or something. In addition, Mr. Goodshow has apparently been working on his doctorate or something because he's now being called Professor Goodshow in the dub. The biggest surprise to me is that the badge case went unedited for the first time ever on Kids' WB! I think this is actually the last time we ever see this badge case (he gets a new one in the next saga), but it's still nice to see 4Kids realize that kids have been seeing the unedited badge case in every episode this season and left it as-is. The first shot of the episode is two seconds shorter in the dub. May: "The fuel of champions! Chicken noodle soup!" I don't have to tell you that Haruka was originally talking about ramen, right? I don't? Great. 4Kids pretty much abandons this cop-out and just goes to calling them noodles for the rest of the episode, so you really wonder why they bothered to call it chicken noodle soup in the first place. Then, a second is cut from the shot right after that. All of the scribbles on the walls of the ramen shop are wiped clean from the dub. I call them scribbles because, while they resemble the sort of calligraphic Japanese you'd see in Japanese ramen shops, I don't think any of the writing actually has any meaning. A second is cut from the shot right after the Trainer's Choice commercial break. Three seconds are cut from the shot of the flame after Kids' WB! 's final commercial break. ...and a second is removed from the TO BE CONTINUED... screen.